–Another fine outing by Dan Straily. He was perfect through four, and finished with a line of: six innings, two runs allowed on three hits (two of which were solo home runs), six strikeouts, no walks. He improved to 7-6 with a 3.76 ERA. 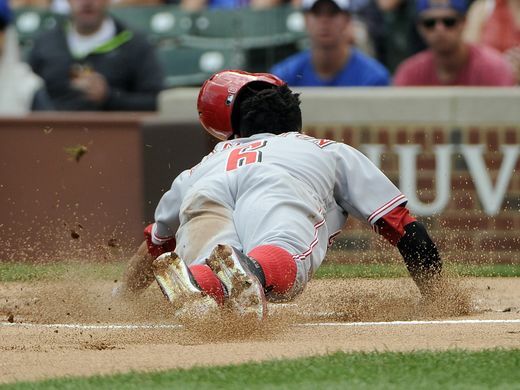 –In the top of the first inning, Billy Hamilton walked, stole second, stole third, and scored Cincinnati’s first run on a groundout. Classic Billy Ball. He was just getting started. Billy reached base four times, going 3-4, with a double and four stolen bases and a simply gorgeous defensive play in centerfield (you can see that catch below). Hamilton now has 43 stolen bases, which leads the league. –Brandon Phillips continued his hot hitting, going 3-4 with two RBI. Like Hamilton, BP made an excellent defensive play, as well. That’s five consecutive games in which Phillips has collected at least two hits. Not bad at all. –Joey Votto was 0-0 with a run scored and an RBI today. Yep, three walks and a sacrifice fly. –Tony Renda collected his first big league RBI when he singled in Eugenio Suarez in the seventh inning. –With a 7-2 lead, Raisel Iglesias took over for Straily in the 7th. He proceeded to walk the bases loaded. A fielder’s choice made the score 7-3, snapping Iglesias’ scoreless inning streak at 22 and 2/3. A fly ball to center was the second out, then another Pirate single loaded the bases again, whereupon Josh Harrison came within a couple of feet of a grand slam down the left field line. Iglesias struck him out on the next pitch. Three walks and a single, and Iglesias escapes with just one run allowed in his inning of work. –Scott Schebler went 0-4 today with four strikeouts. He’s 2-17 since that walkoff home run the other night. –Phillips is hot at the plate, but we saw some classic BP baserunning in the eighth. After Phillips singles, the pickoff throw to first got past the first baseman, and BP tried to make it to third. The throw beat him easily for the first out of the inning. 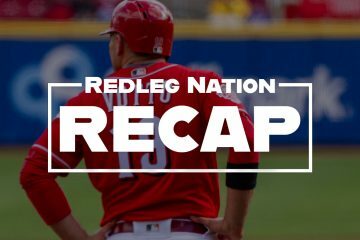 –Reds didn’t win this series, but today’s game was a lot of fun. –If you aren’t happy with Straily’s performance this season, I don’t know what you’re looking for. He isn’t a superstar, but Straily has been everything the Reds could have wanted and more. –Cincinnati scored their final run on a wild pitch from former Red Curtis Partch. 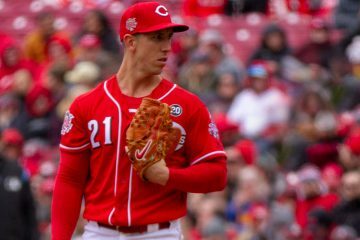 –I already mentioned Iglesias, but Michael Lorenzen and Tony Cingrani weren’t sharp either, despite pitching scoreless innings. In the ninth, Cingrani gave up a leadoff single to Jordy Mercer, then promptly picked him off first base (although it took a replay challenge by Bryan Price for the umpires to get the call correct). Cingrani then walked the next hitter, but was bailed out by a double play ball. Game over…and this one belongs to the Reds. Since 7/22, Phillips is hitting .357/.390/.554. Good for 151 wRC+. Joey Votto and Brandon Phillips each batted four times today. Votto saw 26 pitches in his 4 ABs. Phillips saw 9 pitches. There's no way Billy Hamilton doesn't win the Gold Glove this year, right? Can we just say that Billy Hamilton is a good player now and stop wondering if he might be? Can anyone tell me what BHam’s conversion rate is – runs scored over times on base – versus the league average? I realize that’s highly dependent on the number of outs at the time he reaches base, and on whether or not there’s anyone ahead of him, and on whether he walks / singles, doubles or triple, but I’d love some quantitative sense of how much better he is at scoring than the league average player. I feel like it’s a lot better. Another nice game for Billy. I find it hard to admit this, but I am disappointed if there someone on second Billy Hamilton gets on first. Among players with at least 25 runs scored on the year, Billy Hamilton ranks 13th (out of 260) in the majors in “conversion rate” (runs scored/hits+walks+hbp). Hamilton’s actual rate is 48.5%. Duvall’s is 51.3%. I’d like to see that stat without the home runs. Everyone’s conversion rate is 100% on homers, so the sluggers get a big boost over the speedsters. Still, even with that handicap I’m not surprised to see Hamilton near the top. Should the conversion rate formula also include times reached base by error? In Hamilton’s case, I would think that is also a factor in his favor. Likely has to do with Hamilton batting 7th/8th quite a bit this year. From the 1-2 hole, he’d be over 50% I’d say. Funny, I was curious about this as well and looked at the numbers a couple weeks ago; so, my data is a couple weeks old. If you exclude home runs, Hamilton converts at a 50% clip. League average is about 30%. I included the top 250 batters with the most at bats. Rougned Odor is second at 47%, Ian Kinsler is third at 45%. In reference to a previous article here on Redleg Nation, Joey Votto – Deviant, Hamilton is 3.24 standard deviations above league average, and .46 above second place. I think that would have put him second or third in the charts from that article related to how “deviant” certain batters were. What made that play freaky was that as the ball was headed down the right-field line, I thought he could make third. Marty Brennaman was telling him to go, but as Brantley pointed out, instead of hitting the sidewall and caroming farther away, or maybe just stopping there, the ball hit something, maybe a ballboy’s chair, and bounced back toward Josh Harrison, who then threw Phillips out. It might not have been worth the gamble overall, but I at least understood why he tried for it, unlike some of his other base-running escapades. I think Schebler is 0 for 15 since getting hit by pitch on the knee. Seems to me that Schebler is injured. On billy sure is fun to watch. seems to me he transcends metrics and their aren’t stats to measure his true value. Not saying he is better than Joey Votto or anything that extreme but his ability to generate lightning on the basebaths certainly appears to be a catalyst for the rest of team. Billy is an above-average major league player, overall. He makes peanuts (comparatively speaking). IMO, he’s a very valuable asset to have. Agree, Patrick, and would add that he is one of the most fun to watch in my long memory. That catch was other-worldly. Aaron Bradley above I think has it. I think there is certainly a chance that his knee is still hurting. Think he needs the night off tonight. If not for Wilson Ramos, Phillips could have been NL player of the week. It would have been interesting to see the reaction from those of you who have already written him off as a major leaguer! Saying he’s not a major leaguer would be an overstatement of what I’ve read others say here. From an offensive and defensive standpoint, yes, he is below average among all starters. He has had some bright spots during the season though. Overall, it hasn’t been a very productive year for him. That shouldn’t be a surprise. I think the biggest discussion has been about whether it’s time to move on and play the young guys, some of which the team has burned service time while sitting them on the bench, in favor of Phillips. They’ve tried to trade him, even to teams in a seemingly better situation for BP, but he’s rejected those trades. On the one hand, the team doesn’t want him and seems to understand it’s time to move on. On the other hand, the team can’t figure out how to move on. There seems to be a solution for that. any idea why herrera has sat three games in a row at louisville? This was only the second game that Raisel Iglesias and Michael Lorenzen have pitched in the same game. They both pitched on June 24, which was Lorenzen’s first game back off the DL. Iglesias’ first game back off of the DL was June 21. Just an interesting note. Not that it means much of anything. I bet that’s because Iglesias struggled in his inning. The plan was probably to have him pitch 7-8. Tom D. is going to have an awesome Down on the Farm report I would imagine this week. TJ Friedl and Jose Siri in Billings. Jackson Stephens still on a roll in Pensacola. Nick Senzel on a roll in Dayton that would make Roll Tide Roll envious. It sure was the Billy show.If he and a few others could get there OBP up over 300 this team could score a lot of runs because they also have power.Maybe taking pitches and working the count is way over rated but I see more of this from Billy,Duval and sometimes Suarez like he did in the ninth on Friday night.As we go forward into next year and beyond I can see us having players with higher OBP,either through their own improvement or guys like Winker and Senzel who seem to have that talent already.Its very important we get their so not to waste what I expect to be a top 5 pitching staff as well.Things look bright for the Reds but remember what division we play in.Go Reds. You’ve got to imagine that the Reds will have / should have a similar situation to ARod with BP. I’m not talking retirement, but something along the lines of ‘we’re clearly in a youth movement, either accept a trade we can put you in to a contending team, or sit on the bench’. LH reliever Brian Matusz was outrighted by the Cubs from their 40-man roster. Not DFA’d but outrighted. The Cubs got him after the Orioles DFA’d him earlier this year. But the Cubs brought him up to start a game, got shelled, 6 runs in 3 innings, and now outright him as he has to pass through waivers. The Reds could pick him up on waivers, put him at AAA in the bullpen, and see what he has. He had 4 good years in Baltimore’s pen. The Reds need a little LH bullpen help. The Reds also could use some veteran leadership in their bullpen not named Ohlendorf for 2017. This would be a move more for 2017 than this year. Assign him to AAA, possibly a September call-up, and get him ready over the winter for 2017. If he has it in spring training, then a good pick up. It might be a better move than the usual plethora of Jocketty minor league contract signings just before spring and see what might shake out, if anything. I wonder if he’d be arb eligible at the end of the season and how a non-tender would work in that situation? Would he perhaps sign a MiLB deal with an invite? I like Matusz but wonder what other options he may take over the Reds. That said, certainly doesn’t hurt anything to claim him for the rest of this year. Nick Senzel homered again last night going 1-4 w/ 1-HR. His 3rd straight game with a HR! On the season at Dayton, Senzel is now slashing .331/.438/.503 for a 1.031 OPS. Jesse Winker went 1-3 w/ 1-BB last night. Winker is now slashing .293/.382/.369 for Louisville this season. Senzel just turned 21 & Winker will turn 23 later this month. Can the Reds add another advanced college hitter in the 2017 draft? That would put them in a solid position to become competitive in 2018 and stay competitive for the next decade, assuming someone learns how to manage the roster and service time for all the prospects due to join the show over this and the next couple of seasons. The more I hear about Nick Senzel, the more I get excited about this kid. I love the week BP had but he is still getting long in the tooth with a contract that is no longer team compatible. The fact he shows some flash of offense and had a couple of BP like defensive plays makes him a little easier to move. The youth movement behind him probably isn’t going to match him the rest of this season but who cares? He is not likely to match the kids next year but the cost difference makes it a no brainer, there has to be common ground to get him to retire (unlikely) or accept a trade. The only chance the Reds have of not having to eat a pretty good size portion of his contract is for him to have more weeks like this one. I am a big BP fan but he has to go despite this great week. The biggest point for me over this last 2 months really is this mean that Hamilton is finally getting it? I don’t mean the production he has had which I could probably be ok with. I see some good indicators that he is coming around on understanding what he needs to do with the bat. That is an eye test not number driven, I have seen what looks like an attempt to slap or drive the ball on a line. He is fun to watch when he is getting on base that is for sure!!!!! !